Sydney Showground Stadium will now be known as GIANTS Stadium. A club’s stadium is one of the biggest brand assets available and so to be able to have our own GIANTS brand across a community venue that attracts hundreds of thousands of people each year is a coup for the club. The GIANTS today announced a ground breaking partnership agreement that will see the club’s Sydney Olympic Park home ground named GIANTS Stadium. 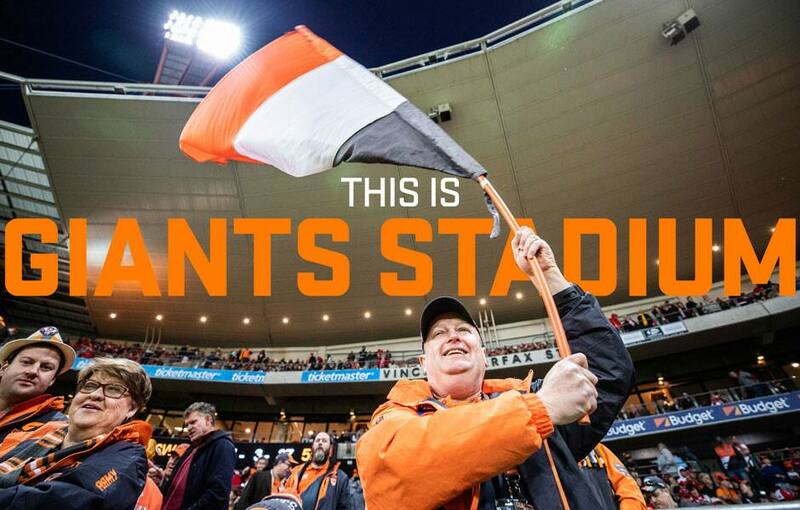 The multi-year agreement allows the GIANTS to secure their own naming rights to the venue formerly known as Spotless Stadium and sees the club in rare company as an elite level sporting organisation playing out of a stadium under the name of their own brand. GIANTS Stadium will be the naming rights designation throughout the year, including during Australia’s largest annual ticketed event, the Sydney Royal Easter Show. GIANTS Chief Executive Officer, David Matthews, said the club is delighted to welcome fans to GIANTS Stadium this Sunday for the club’s opening home game of the 2019 AFL season against Essendon. “To achieve an exceptional commercial return for this opportunity just adds to what is landmark agreement for our club and our code. The GIANTS’ AFL season opener is this Sunday (3.20pm) against Essendon at GIANTS Stadium. Click here to buy your tickets.